Air Italy has unveiled its fully new onboard Business Class product and service today to coincide with the celebration of its inaugural Milan–Los Angeles flights. Featuring stylish and contemporary tableware, cutlery and chinaware, the new Business Class product is being rolled out with a number of service innovations, including dine-on-demand for the rapidly expanding airline’s Business Class customers. Air Italy Chief Operating Officer, Rossen Dimitrov, said: “We are extremely delighted to begin the rollout of our new Business Class product and service today as we simultaneously celebrate the launch of our new service from Milan Malpensa to Los Angeles. “Featuring newly-designed contemporary tableware, in-flight dining menus, cutlery and chinaware that have all been specially crafted to meet our travellers’ high expectations, we are confident that this new product will elevate their experience on board our aircraft. “At the same time, we will also be introducing our dine-on-demand service, meaning our customers can choose what they want to eat, and when they want to eat from our new menus which are also being unveiled today. “All of this will make for an even more sophisticated and memorable travel experience in Business Class with Air Italy – and it will very shortly be followed up by the rollout of our new Economy Class product and service. 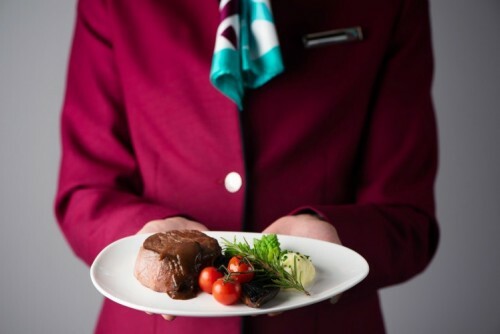 With the new dine-on-demand service, passengers can choose from the extensive à la carte menu, and create and enjoy at any time and in any order their very own dining experience. Starting from the launch on the first Milan-Los Angeles flight today, the new onboard business product and service will be rolled out across Air Italy’s fleet and network over the coming weeks. Beginning in May 2018, Air Italy added new domestic routes from Milan to Rome, Naples, Palermo, Catania, Lamezia Terme and Cagliari (April 2019), all scheduled for connection to its newest long-range destinations including New York, Miami, Los Angeles and San Francisco (April 2019), Toronto (May 2019). Its network also includes direct international flights from Milan Malpensa to Accra, Cairo, Dakar, Lagos, Sharm El-Sheikh, and, from its Olbia Costa Smeralda hub, year-round scheduled services to Rome, Milan Linate, Milan Malpensa and Bologna and seasonal ones to a wide range of domestic and regional destinations.